This was a week of “firsts” for me. I tried boxing for the first time. Loved it! What a great stress reliever. I thought I was in shape since I work out 6 days a week between running, biking, strength, and Pilates, but I was not prepared for the oh-man-kill-me-now feeling I got during the boxing workout with Mike. Bring on the pain! I did my first speedwork run. I ditched the half marathon training schedule I painstakingly wrote for myself and decided to try the FIRST program instead. I re-wrote my runs and incorporated my data from the McMillan Running Calculator to give me a training plan that spells out my training paces. I drove in snow for the first time this winter. Ok, maybe it wasn’t the first time, but the other snowfalls didn’t count because they didn’t even stick for longer than a day. What’s up with that, WI? I watched my first episode of Dance Moms: Season 2. I love bad TV. Usually the participants just gets another blogger’s recipe, but they shook it up a little this week: we each got a blog and had the freedom to make whatever we wanted from that blog! I got Fried Ice and Donut Holes and she has so many great recipes to choose from!! I spent over an hour looking at her blog before finally deciding on the dish I wanted to try. The luck recipe? Shrimp fra diavolo! It’s been on my “must cook” list for a while and I figured this was the perfect time to try it. The dish turned out pretty darn good. Mike loved it; I think it could have been a little (ok, a lot) spicier. But hey, I’m weird and I love major heat in my food. Next time I’ll be crankin’ up the spiciness by adding a few more sprinkles of red pepper flakes to my portion! Meanwhile, heat olive on in a large skillet over medium heat. Season shrimp with salt and pepper. Add to skillet and saute for 1 minute. Turn shrimp and saute the other side until shrimp are cooked through and no longer translucent. Transfer shrimp to a separate plate. Add onions to pan and saute until translucent, about 5 minutes. Add garlic and saute for an additional minute. Add wine to pan to deglaze and allow to simmer for 1 minute. Add tomatoes, red pepper, and oregano. Reduce heat to medium-low and let sauce simmer for 10 – 15 minutes, until reduced to your desired consistency. Return shrimp to sauce and stir to coat. 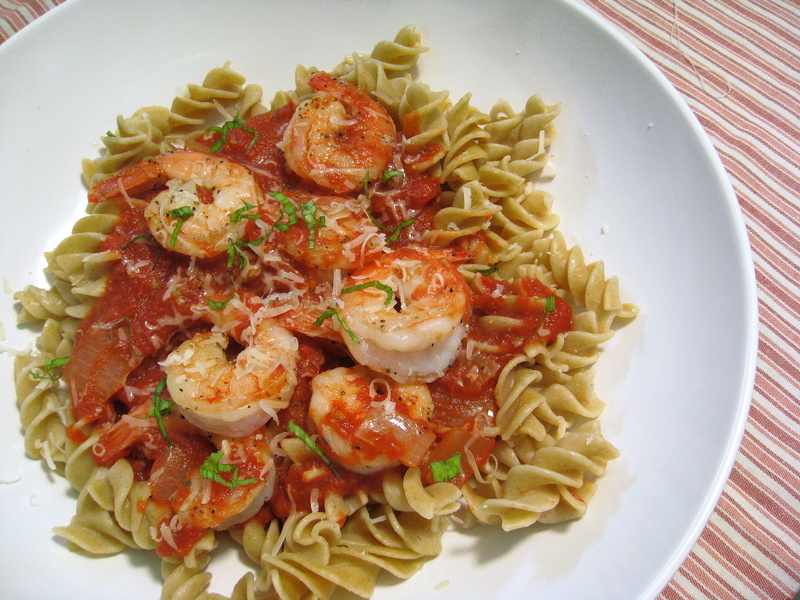 Toss cooked pasta with sauce and shrimp. Garnish with basil and Parmesan cheese, if desired. Categories: Main Entrees, Meat, Pasta, Run, Seafood | Tags: main dish, pasta, running, shrimp | Permalink. I love shrimp fra diavlo but I’m a wimp when it comes to heat. I like this recipe because you can adjust the spiciness at the table with some more red pepper flakes. I’m so glad you liked the recipe! My husband likes this dish much spicier than me, so he sprinkles on a bit more pepper flakes at the table whenever I make it.